Two Wakkerman F2D planes go at it in 80mph Combat at C-Cup No. 3. 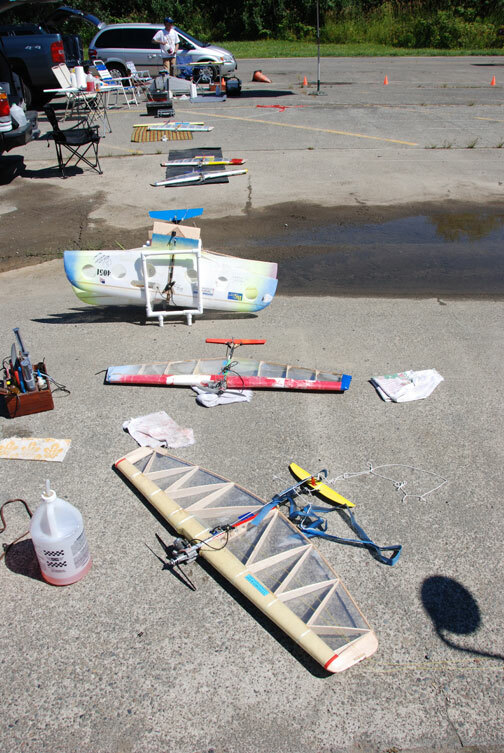 At left is Buzz Wilson's plane; at right is Ken Burdick's. Flying Lines photo. 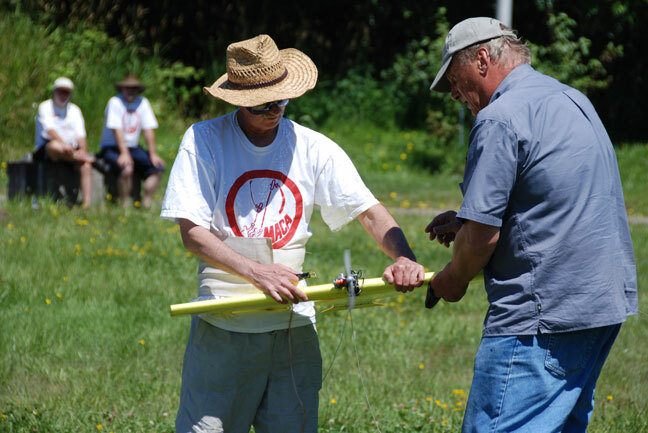 Saturday, July 23, 2011, Chehalis, Wash.
On Saturday July 23, the third C-Cup returned to Yard Birds. 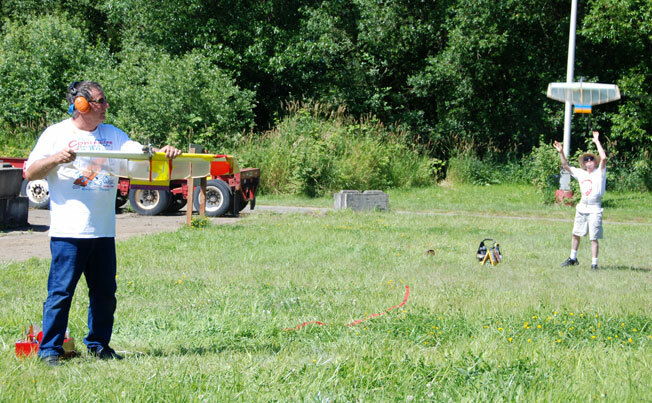 The Nisqually site was being used for a baseball game. Darris McDainel the president/owner of Yard Birds' came out to welcome us and is sincerely thanked for his support. Eight flyers showed up to fly - Don McKay, Jim Green, Robert Smith, Gene Pape, Jeff Rein, John Thompson, Ken Burdick and myself. Because I knew who would be attending, five rounds were pre-drawn which meant 20 matches. At the pilots meeting, we discussed if we wanted to fly everyone, which meant 28 matches. The vote was to fly five rounds. During the pilots meeting, we again emphasized staying in the circle. We started at 10:00 AM and were half way through the contest by noon. This is the third contest flown under the new rules. One point for a cut, deduct one point for each down time incident, and three minutes flying. The contest places are decided based on cuts minus down deducts, if there is a tie the winner is decided by how the tied competitors did head to head. If this does not resolve the issue, then it goes to who can spit a glow plug the furthest or if they choose, fly a match. Twenty matches were flown with 20 cuts and 36 down time incidents or 1.8 down time to cuts. 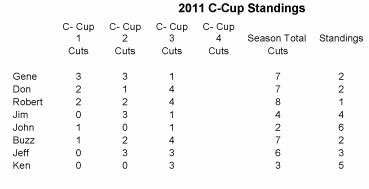 In C-Cup 2, it was 1.6 down time to cuts. Four of the 20 matches were ties. Two flyers got four cuts in five matches. Gene snatched the down time incidents away from Don with seven. Don would have tied Robert for first had he not had six down time incidents. During the lunch break, a discussion was held on replacing the combat events that have been eliminated from the Raider Roundup. The Northwest Skyraider has moved the contest from Chehalis to Auburn. At the end of the day, Robert Smith had first. Robert who had returned from the Nats where he spent time rummaging through garbage cans in search of food (Robert has to be fed and watered every three hours) found some discarded Streamer Shuttles. These are F2D planes that Lester Haury designed and kits. Robert salvaged them and was enjoying the way they fly. There was a three-way tie between Jeff Rein, Ken Burdick, and myself, each with a score of zero. Because I beat Jeff, he automatically got fourth. In the head-to-head match comparison, Ken and I tied; in fact, we had identical records against all common opponents. Ken and I decided to fly a match for second and third. Ken and I had a heated match with Ken getting the first cut. After 30 seconds of passes at each other, I got the cut back and then I heard Ken's engine shutting down followed by a stream of expletives. A faulty repair job caused Ken's plane to spit out the bladder. By the time he had put the bladder in and had it fail, time had run out giving Ken third place. With only one C-Cup remaining, it is wide open as to who will be the champion. Robert has taken over the lead from Gene with eight cuts. There is a three-way tie between Don, Gene, and myself with seven. Jeff who has won the cup for the last two seasons has six. Place your bets. 5. Don McKay, Redmond, Wash.
6. John Thompson, Eugene, Ore.
7. Jim Green, Bellevue, Wash.
8. Gene Pape, Eugene, Ore.
Chehalis Cup Contest No. 4 is scheduled for Aug. 27. See Where the Action Is for details. The Yard Birds parking lot serves as pit area. Flying Lines photo. 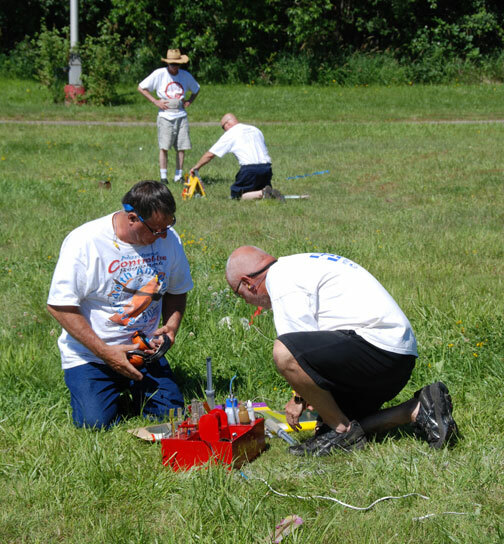 Don McKay warms up his engine as Jeff Rein holds, with judges in the background. Flying Lines photo. Don McKay (left) and Jim Green in hot combat. Flying Lines photo. 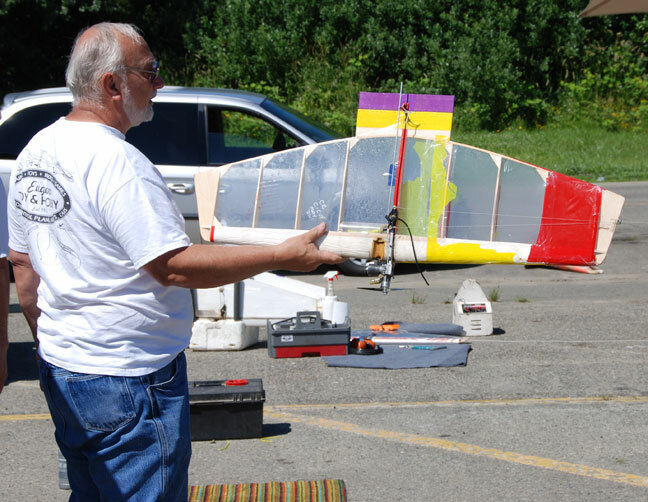 Gene Pape holds Buzz Wilson's plane for a level check. Flying Lines photo. 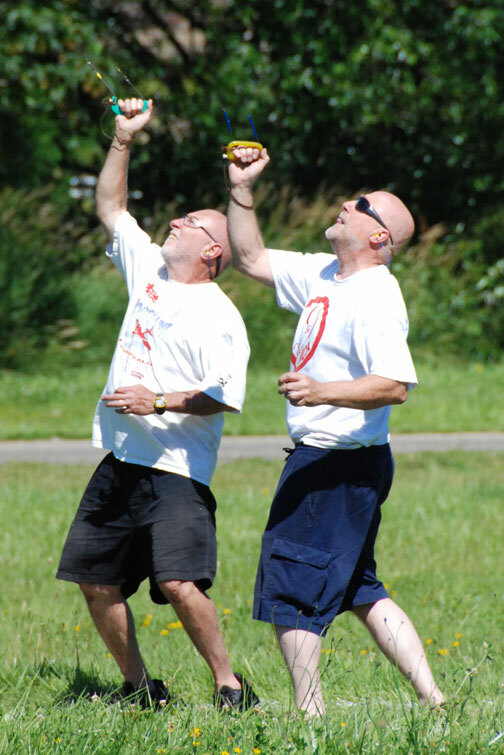 Two fliers get ready for a match, with pit crews. In foreground, Buzz Wilson with Bob Smith assisting; in background, Ken Burdick with Jeff Rein standing by. Flying Lines photo. 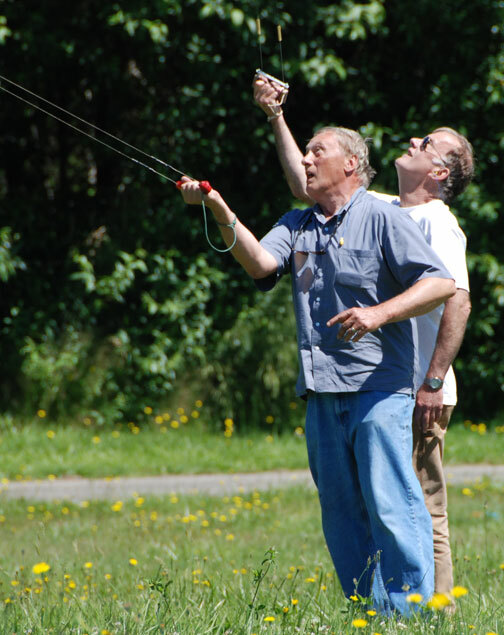 Jeff Rein releases Ken's plane as Bob Smith holds Buzz's, awaiting the launch signal. Flying Lines photo. Buzz Wilson (left) and Ken Burdick in combat. Flying Lines photo.